Messier 84 (also known as M84 or NGC 4374) is an elliptical or lenticular galaxy in the constellation Virgo. M84 is situated in the heavily populated inner core of the Virgo Cluster of galaxies. Radio observations and Hubble Space Telescope images of M84 have revealed two jets of matter shooting out from the galaxy's center as well as a disk of rapidly rotating gas and stars indicating the presence of a 1.5 ×109 M☉ supermassive black hole. It also has a few young stars and star clusters, indicating star formation at a very low rate. Charles Messier discovered Messier 84 on 18 March 1781 in a systematic search for "nebulous objects" in the night sky. The object is the 84th in the Messier Catalogue. Two supernovae have been observed in M84: SN 1957 and SN 1991bg. 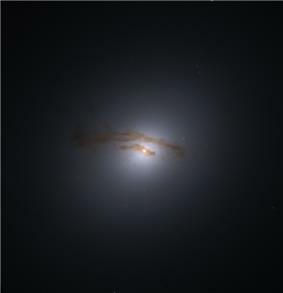 Possibly, a third, SN 1980I is part of M84 or, alternatively, one of its neighboring galaxies, NGC 4387 and M86. ^ a b c d e f g h i j "NASA/IPAC Extragalactic Database". Results for NGC 4374. Retrieved 2006-11-14. ^ J. L. Tonry; A.Dressler; J. P. Blakeslee; E. A. Ajhar; et al. (2001). "The SBF Survey of Galaxy Distances. IV. SBF Magnitudes, Colors, and Distances". ^ Finoguenov, A.; Jones, C. (2002). "Chandra Observation of Low-Mass X-Ray Binaries in the Elliptical Galaxy M84". ^ Bower, G.A. ; et al. (1998). "Kinematics of the Nuclear Ionized Gas in the Radio Galaxy M84 (NGC 4374)". ^ Ford, Alyson; Bregman, J. N. (2012). "Detection of Ongoing, Low-Level Star Formation in Nearby Ellipticals". American Astronomical Society. ^ Götz, W. (1958). "Supernova in NGC 4374 (= M 84)". ^ Kosai, H.; Kushida, R.; Kato, T.; Filippenko, A.; et al. (1958). "Supernova 1991bg in NGC 4374". IAU Circ. 5400: 1. ^ Smith, H. A. (1981). "The spectrum of the intergalactic supernova 1980I".